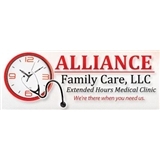 Alliance Family Care LLC (Covington) - Book Appointment Online! When you're injured or sick and need immediate affordable care, come to Alliance Family Care in Covington Georgia for Medical care from our board-certified doctors. Our caring doctors and health professionals are there when you need us--6 days a week, with extended evening hours. Walk-ins and same-day appointments are welcome. Ages starting with 18 and up. Marisa and the nurse who saw me we're both excellent. Light hearted and caring, wanted to make sure that my injury wouldn't cause excess problems down the road. Very happy with their care and would recommend to anyone needing a visit or checkup. She is an excellent Dr. She really listened to me about my medical problems. The nurses were also awesome. Was great meeting a Dr. that seems to really care. It was my first visit & I look forward to working to get better with her. Dr. Abbasi did an exceptional job! I felt very comfortable and confident in his judgement. I appreciated him taking the time to listen to my concerns and not rushing to the next patient. I highly recommend him.